World War I might conjure up images of the trenches of the Western Front, but it was a far more complex conflict fought in a number of theatres: an air war, a war fought in the Balkans, Italy, Africa, Turkey, the Middle East, and also a naval war in the South Atlantic, South Pacific and Indian Oceans. It truly was a global conflict. The Military Atlas of World War I is a comprehensive visual guide to this complex conflict. It plots the exact course of the land, sea and air campaigns in fine detail, enabling the reader to trace the ebb and flow of the fortunes of all sides. With the aid of more than 160 full-color maps, every theatre of war is covered – from the Western Front to Sumatra, from Gallipoli to Galicia to Ghana, from Dogger Bank to Dalmatia, from Romania to Rhodesia, from the Falklands to Togo to Sinai. All the maps have been specially commissioned from an expert cartographer. Each map has been designed to highlight a particular aspect of the war, thus they vary in shape and size – from isometric to semi-circular and full-page to double-spread – and in outlook, with some maps giving a global perspective while others depict the exact movement of armed forces on the land, sea and air. Battles such as Jutland, the Somme, Cambrai and the Gallipoli campaign are shown in great detail. All maps are accompanied by a key, which helps the reader to understand the action and events. 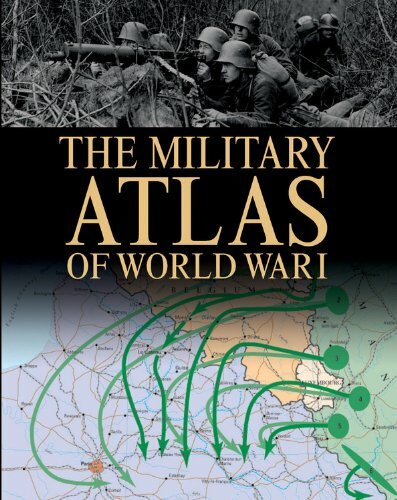 With expert, accessible text and 150 color and black-&-white photographs and illustrations, this complete atlas provides an invaluable work of reference for both the general reader and the serious student of World War I.
Dr. Michael Neiberg is Co-Director of the Center for the Study of War and Society at the University of Southern Mississippi. He specializes in the comparative history of War and Society since 1789, and is a founding member of the Société Internationale d’Étude de la Grande Guerre. He is the author of, among other books, Dance of the Furies: Europe and the Outbreak of World War I, The Second Battle of the Marne, Fighting the Great War: A Global History, Warfare in World History, Foch: Supreme Allied Commander in the Great War, World War I: The Western Front 1914–1916, as well as numerous articles, book chapters, encyclopedia entries and reviews. He is also the editor of The Great War Reader.